Friendship can lead to some of the most amazing achievements. When Sharon Jalette of Farmingville, NY, was asked by a friend to create an identifying tag for her nonverbal child with autism to wear in the car in the event of an emergency, she jumped at the chance to help. As the child of a long line of Italian seamstresses and pattern makers, Sharon did what she knew best—she reached for a needle and thread. 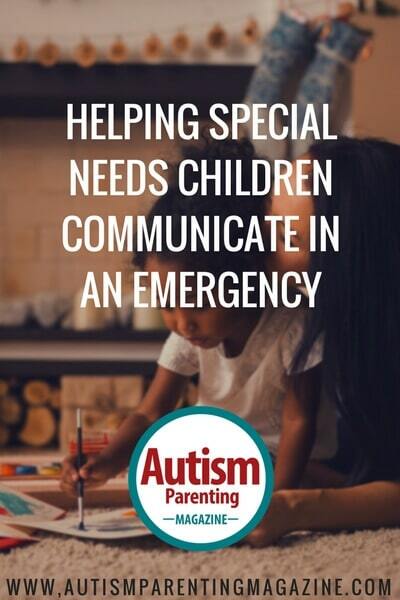 It wasn’t long before Sharon developed an innovative way for kids with autism to communicate critical contact and medical information to emergency personnel and first responders. The fabric sleeve, which closes with a hook and loop strip around the vehicle’s seat belt, secures a child or adult into a vehicle or a vehicle safety seat. It contains medical and emergency contact information, so if a child or adult with special needs is discovered in a motor vehicle accident and is not able to communicate, the information is readily available. Q: What inspired you to develop the Seat Belt ID Sleeve? A girlfriend of mine asked me to embroider a patch or tag for her child’s car seat that would identify her son as having autism and that he was nonverbal. She was concerned if she was injured and could not speak for her child, a first responder would not know how to help. Q: How would you explain the benefits of the Seat Belt ID Sleeve? These sleeves can convey any information that is pertinent to the medical care of an injured or disabled person. They can help people with heart pump implants [or] anyone adult or child who has a disability that is not “visible.” Elderly who are forgetful can benefit from this sleeve on their purse strap or their pants belt. The sleeve can give medical instructions; emergency contact info; drug allergies; or even a name, address, and phone number for someone who cannot immediately recall the information. Q: Who benefits most from Seat Belt ID Sleeve? People of all ages and people with and without a medical condition can relay any information. I have made a sleeve for a salesman who spends most of his time in his vehicle and has a pet sitter to care for his dog during the day. What if he were rushed to the hospital after an accident? The sleeve listed the pet sitter and her phone number so she can take care of his dog until he gets home. Q: What has the response been like toward your product? The response has been overwhelmingly positive, and I have sent orders as far as Alaska and California. Mostly, I get requests for medical information for children and especially those who cannot communicate. I have gone to trade shows to promote this item, as well as the special education departments in schools. Q: Could you share one of your favorite success stories? Yes, there is a man named Vince who has a LVAD implanted in his chest. This pump is what is keeping him alive until a heart transplant becomes available. He does not have a pulse, nor does he have a blood pressure. I made him vehicle sleeves with his medical team’s information, and I made sleeves for his medical bags, which must stay with him at all times. They contain the batteries that give power to the pump. The airlines asked him to check the “personal” carry-on bags, as he had one too many. It was the pilot who read the embroidered sleeve and allowed him on the plane. Vince stated without the sleeve that he would not have been able to see his grandson in California! For more information on the product, to place an order, or to discuss any other services that are available, contact Sharon directly by sending an email to onestitchatatime@mail.com. Please feel free to leave any comments, feedback, or suggestions you have about this product.